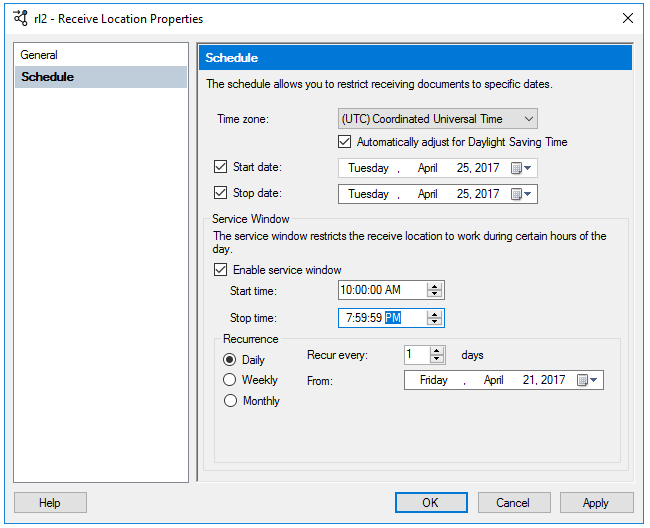 Set the timezone and configure a recurrence schedule on your receive locations in BizTalk Server. 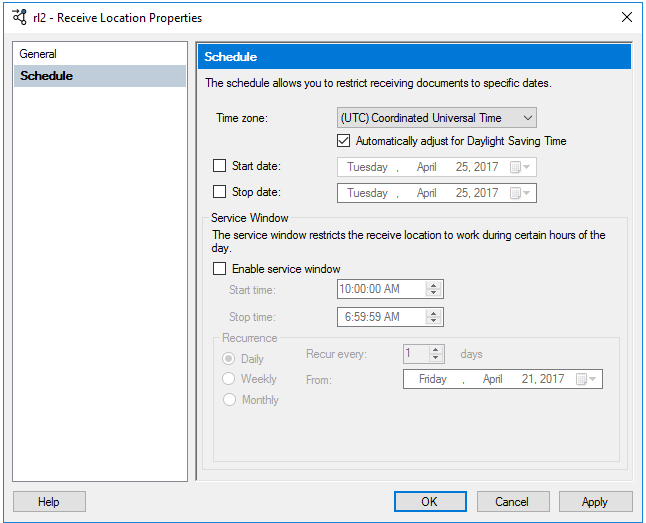 Starting with BizTalk Server 2016 Feature Pack 1, the advanced scheduling feature on receive locations includes some options. Using the advanced scheduling options, set the time zone, and also set a recurrence schedule. This topic shows you how to configure these features. Install Feature Pack 2 on your BizTalk Server. The Schedule properties of a receive location includes a Time Zone property. When set, the time zone you choose in the receive location is used instead of the time zone on the local computer. All dates and times in the Schedule properties are specific to the time zone you choose. Any existing schedules are migrated to the time zone of the server hosting the BizTalk Management database (BizTalkMgmtDb). In the BizTalk Server Administration console, right-click one of your receive locations, and select Properties. Use the Monthly recurrence to run the receive port on a monthly schedule. The Days and On options are available.